What will the alien archaeologists make of my knitting bag in 10,000 years? In archaeology, they say that you can learn as much from a civilization’s trash as from its literature, art and science. Perhaps more. Well, here’s my miscellaneous “trash”–the results of emptying my project bag, then holding it upside down and shaking it over the carpet. 1 small ruler, almost never used because I can never find it. It likes to stick to other things with static electricity. 1 unit of measuring tape, which lives in this little drawstring Settlers of Catan dice bag. 2 band-aids, which I really should keep in my primary notions bag where they’ll be of use. 1 pot of scented knitter’s hand cream, which I like, but which the men in my life can’t stand. Sigh. 1 stray KnitPicks needle tip, size unknown. 1 unsharpened pencil – heck if I know why this is in my knitting bag. 1 receipt from Dunn Brothers – the local coffee shop where my Wednesday night knitting group meets. I imagine the alien archaeologist examining my trash, thousands of years in the future, and drawing conclusions about me and my knitting habits. Knitting was a dangerous past-time, requiring frequent application of first aid. Knitters often congregated in commercial food establishments. Perhaps because their avocation left them no time for conventional food preparation. Knitters were scavengers, like blue jays, constantly picking up and re-purposing common items. Perhaps this writing implement was used as a substitute cable needle. What else do you think future archaeologists will think of us knitters based on our trash? Next How Could I Not Know That? Plus Some Knitting. Lol! I love that! 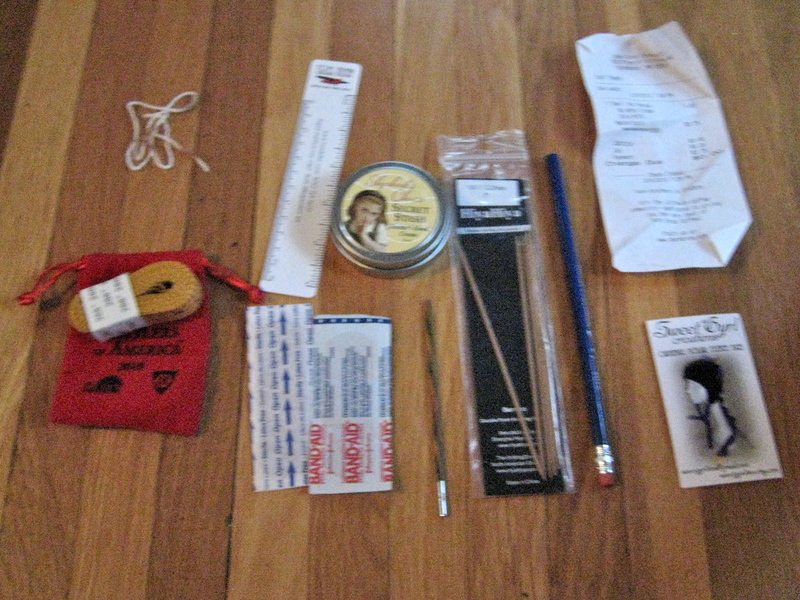 I think anyone who looks in my bag will draw one conclusion only…knitters are packrats, lol! I’ve wondered the same thing. Future archaeologists would probably think I’m disorganized – or a compulsive ‘starter’ who really likes starting projects – since I’ve always got a few projects going at the same time.